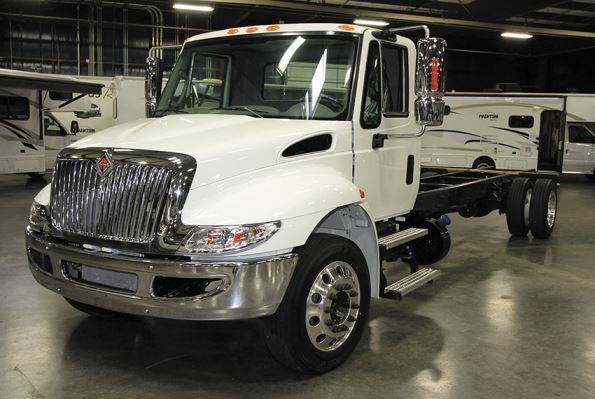 The NeXus Wraith starts with an International DuraStar Lite 300-horsepower chassis. A Super C diesel motorhome built on the International DuraStar Lite chassis. In the fall of 2017, NeXus RV launched its newest motorhome, the Wraith Super C diesel. The name may bring to mind the most powerful car ever built by Rolls-Royce, also called the Wraith, a twin-turbo, 624-horsepower machine that can go from zero to 60 mph in 4.4 seconds. Interestingly, Rolls-Royce built the original Wraith back in the 1930s as a rolling chassis, which was sold to builders that did their own bodywork on top of the chassis. In some ways, this is similar to the RV industry, in which coach manufacturers construct their product on top of chassis often supplied by other vendors. The Wraith came about after NeXus RV’s successful introduction of the Ghost Super C motorhome in 2013. Company officials identified a need for a more affordable Super C that could compete with entry-level Super Cs from other manufacturers, but without sacrificing quality. 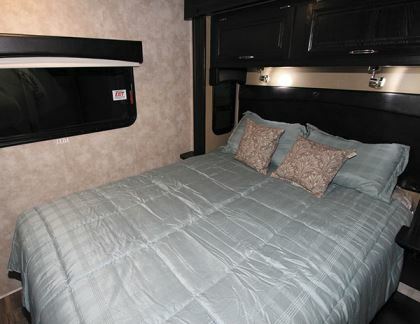 The Wraith is packed with features not normally found in a motorhome at this price point and is available in four floor plans ranging from 32 feet to 36 feet long. We chose a 32W as the subject of this review. The Wraith is built on International’s DuraStar Lite chassis. The DuraStar is powered by a 6.7-liter Cummins ISB diesel engine, producing 300 horsepower and 660 pound-feet of torque. An Allison 2500 Series six-speed automatic transmission passes that power to the rear wheels. A 70-gallon diesel fuel tank and a 7-gallon driver-side DEF tank feed the engine. The Wraith’s gross vehicle weight rating (GVWR) is 23,500 pounds, and its gross combination weight rating (GCWR) is 33,000 pounds. The 10,000-pound Class IV towing hitch gives this motorhome plenty of towing capacity. The front gross axle weight rating (GAWR) is 9,000 pounds, while the rear GAWR is 15,500 pounds. Actual scale readings on this test coach were 7,305 pounds on the front axle and 11,430 pounds on the rear axle, for a total weight of 18,735 pounds, yielding a respectable cargo carrying capacity of 4,765 pounds. This weight was taken with full fuel and propane. The sticker weight figured in an additional allowance for four passengers averaging 150 pounds each. NeXus designers didn’t cut corners in the Wraith’s construction. For example, high-strength low-alloy steel frames the walls and ceiling in place of the aluminum commonly used. NeXus cofounder Dave Middleton cited an independent study that found low-alloy high-strength steel could increase structural strength up to 72 percent versus aluminum. The steel adds approximately 70 pounds to the coach’s weight, but NeXus officials concluded that the increase in structural strength, torsional rigidity, and occupant safety was more important. In fact, the minimal weight increase doesn’t make much difference on a coach of this size. NeXus designers were able to reduce weight elsewhere by using Azdel composite panels in the walls and ceiling in place of plywood and lauan. Wood can absorb moisture and expand, leading to sidewall delamination. Azdel is lighter than wood, has a higher R value, is impervious to water, cannot rot, and will not support black mold. Though some other manufacturers utilize Azdel, NeXus claims to be the only one to incorporate the product on the outside, as a fiberglass backer, and on the inside of its vacuum-laminated wall structures. Azdel’s higher cost, when compared to lauan, is likely a limiting factor to some manufacturers. The Wraith’s steel subfloor is promoted as the best in the business, with a 3,000-pound payload capacity per truss. The Wraith features fiberglass sidewalls covered with deluxe four-color full-body paint. Our test coach was finished in Midnight, one of three available color schemes. A seamless fiberglass roof wraps around to the sidewalls, which allows roof water to run off rather than become trapped. Molded front overhead and rear eyebrow fiberglass caps give this motorhome an attractive and stylish look. Chrome is used for the grille, front bumper, and mirrors; it really looks sharp with the dark Midnight paint scheme. Automotive window seals minimize wind noises when driving. Accu-Slide cable-driven slideouts from BAL RV Products Group, a Norco Industries brand, are used on this motorhome. Company officials say they have been proven more reliable than other offerings. Basement compartments are constructed of galvanized, powder-coated steel instead of rotocast plastic, which results in a more durable compartment capable of carrying greater weight. Bigfoot-brand hydraulic levelers are dual-powered, in that they use hydraulic power to raise the jacks as well as to extend them. The power awning is equipped with LED lighting. The Wraith’s interior is equally as attractive as the exterior. Glazed maple raised-panel hardwood cabinetry is standard, although this particular coach had the optional Dark Forest wood cabinetry. The dark wood was offset by optional Beau vinyl flooring in a bright elm color, one of three available choices. The interior décor, Cream/Chestnut, also was one of three choices. The vinyl ceiling sports LED lighting and a pair of ducted rooftop air conditioners. These units are fitted with galvanized steel ductwork, which eliminates the potential for loose foil tape or collapsed ductwork. The International cockpit area is different from what is common in Super C motorhomes built on other chassis; I found it more user-friendly. Cruise-control switches are on the steering wheel rather than on the dash, and the instrument panel is populated with a battery of gauges to provide plenty of information while driving. 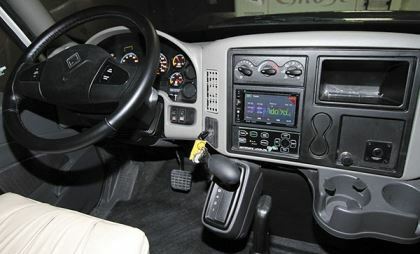 The parking brake and transmission selector controls are comfortably located at the driver’s right hand, while the center dash area sports controls for the cab heating and air-conditioning, the leveling jacks, and the touch-screen dash entertainment center. An optional infotainment system with built-in GPS navigation also is available, although not included on the test coach. Visibility from the driver’s position was excellent, and the design of the flip-open hood allowed the coach to come within inches of any object when maneuvering in tight quarters. The six-way power cockpit seats were comfortable, yet supportive. The main living area held a recliner, a trundle tri-fold sofa, and a Dream Dinette, all covered in Ultraleather material. Both the sofa and booth dinette can be made into additional sleeping accommodations, as can the cab-over bunk, if so equipped. 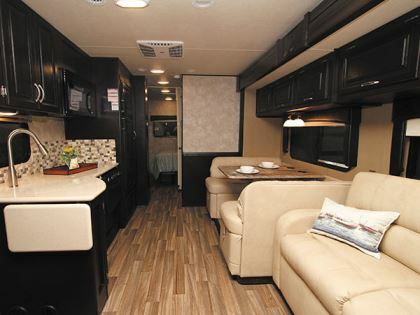 However, the review unit contained the optional cab-over entertainment center in lieu of the bunk; it housed a 32-inch LED TV and plentiful storage space. Optional theater seating is available instead of the sleeper sofa if buyers prefer. The booth dinette provides storage underneath in large, pull-out drawers. This is the first time I’ve seen lockable booth drawers, which is a nice touch. The main slideout fascia is adorned with a carved NeXus logo headpiece. The galley was equipped with an optional solid-surface countertop that held a stainless-steel sink with removable solid-surface covers (laminate countertops are standard). A 7.5-cubic-foot propane-electric refrigerator with freezer is fitted with raised panels that match the interior woodwork. A large pantry with adjustable shelving stands next to the refrigerator. A three-burner cooktop and oven complete the galley base, and an over-the-range microwave with exhaust fan is located in the galley’s overhead cabinetry. The 32W’s bedroom and coach-wide bath area can be closed off from the front of the vehicle. The bath contains a circular fiberglass shower enclosure, a showerhead with a flexible hose, and an optional glass shower door. A skylight in the shower lets in plenty of sunlight, and an electric vent fan ushers out moisture or heat. Across the aisle, a porcelain toilet and a vanity with a stainless-steel sink are located in the street-side water closet. A sizable mirrored medicine cabinet hangs above the vanity. The rear bedroom holds a queen-size bed with a deluxe innerspring mattress; a king-size bed is available on the other, larger Wraith floor plans. The bed is placed in a second street-side slideout to open up the floor space in this area when the motorhome is parked. An expansive cabinet in the wall opposite the bed holds mirrored wardrobe closets and a battery of drawers. A 32-inch LED TV is also located in this cabinetry, along with room for a second Blu-ray player and a satellite TV receiver. Coach power needs are met by a 50-amp shore cord. An automatic transfer switch connects the Wraith’s breaker panel to shore power or to the Onan 6-kw diesel-powered generator, which can be operated from the dash. Two deep-cycle batteries on a slide-out tray provide 12-volt-DC power and are charged by a 60-amp power converter. An optional 1,200-watt inverter provides power for the entertainment center and receptacles. A pair of 13,500-Btu air conditioners comes standard, but 15,000-Btu air conditioners with heat pumps are available as an option. A 40,000-Btu propane furnace provides the interior heat, while a 6-gallon propane-electric water heater handles domestic hot-water needs. The Wraith looks to be a great value in the Super C motorhome category. It’s packed with more features and amenities than one might expect in this price range. As noted, construction standards are noteworthy, including the extensive use of high-strength, low-alloy steel and Azdel substrate in the ceiling and sidewalls. The cockpit was one of the more driver-friendly ones I’ve been in. Plus, service for the International brand is widespread; likewise, plenty of facilities are available for servicing the Wraith’s Cummins ISB engine. The motorhome drove well and was quiet for a diesel-powered Super C. The Wraith had a solid feel and also handled more crisply than many other motorhomes built on competitors’ truck chassis I’ve driven. 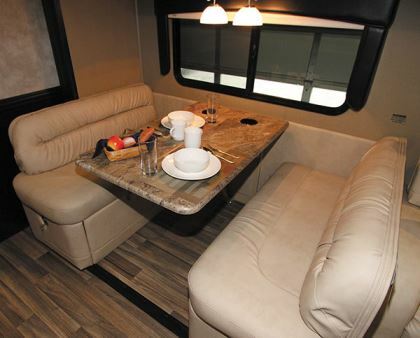 While NeXus motorhomes are not custom-built to each owner’s specifications, the company can handle a reasonable number of user-requested custom features, such as the solid-surface countertops found in this coach. All things considered, company designers did a great job of creating the Wraith at a lower price point in the Super C motorhome category without sacrificing what truly defines the coach as a NeXus RV. In 2010, at the height of the recession, industry veterans Claude Donati and Dave Middleton decided to start NeXus RV in Elkhart, Indiana. Mirroring the economy at large, the RV industry faced some tough challenges. Banks were reluctant to lend money to potential buyers, and dealers had trouble obtaining vehicle floor plan financing. Claude and Dave decided to do things differently by working on a smaller scale with customer-driven products. They began by producing the Phantom Type C and the Viper Type B-plus motorhomes. The RVs were sold factory-direct so the company could direct its energy toward building a quality product that was targeted to a customer’s needs. Within two years, customers were asking for a Super C motorhome with the same quality construction as seen in the Viper and Phantom; the Ghost was introduced. To round out the product line, the Maybach Type A gas motorhome and the Bentley Type A diesel pusher were added next. The Wraith Super C followed in 2017. NeXus RV’s sales grew over that seven-year period, which attracted interest from an increasing number of RV dealers. Company officials decided it was time to move away from the factory-direct model and partner with a few core dealers around North America. After announcing the switch to a dealer sales model, the company turned down orders from more than a dozen dealers in the first week alone. Instead, Claude, Dave, and their team concentrated on adding the dealers they believed were best suited to sell and service the NeXus line. The list can be viewed at www.nexusrv.com/locations.